Is your yoga routine starting to feel a bit too routinary and bland? If you've been thinking of incorporating a yoga wheel into your practice, you're in luck. This week, we're giving away Kino MacGregor's Yoga Pro Wheel Plus to one lucky DYY reader! We teamed up with DYY AllStar and world-renowned Ashtangi and yoga teacher Kino MacGregor to give DYY readers a chance to take home a free Yoga Pro Wheel Plus, which not only elevates the way you practice yoga postures, but can also be used for core and strength training and any other fitness workout. There are sooo many ways you can use the Yoga Pro Wheel Plus—it will help you go deeper into your backbends, extend your reach in forward folds, assist you in arm balances as a mounting prop, modify poses to a level that suits your body, and give an extra oomph and challenge to your core-strengthening exercises. 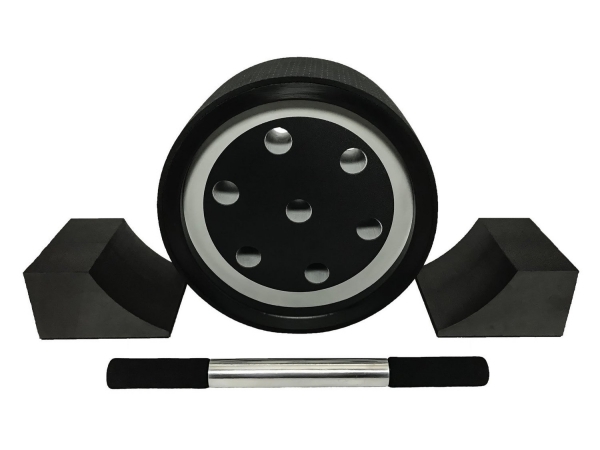 The Yoga Pro Wheel Plus measures 12" in diameter by 5.75 inches wide, giving you better stability via increased width compared to most other yoga wheels on the market. The sturdy wheel design is externally covered by PVC-free, 6mm-thick quality yoga mat to give you traction, safety, and comfort on your mat. 1 x Myofascial Release Bar - can help you target your core muscles and open up and re-align your shoulders. Even if you don't have the time, will, or energy to practice your usual yoga asana routine, you can still use the Yoga Pro Wheel Plus for shoulder and back exercises to relieve everyday backaches, muscle tension, and joint stiffness. The wheel is suitable for ALL practice levels and can help make yoga more physically accessible to everyone. So. Ready to have your very own Kino MacGregor's Yoga Pro Wheel Plus for absolutely free? The giveaway runs from Wednesday, May 17, 2017 to Tuesday, May 30, 2017. One randomly selected user will be chosen to win the Kino MacGregor Yoga Pro Wheel Plus, so make sure to share and comment to enter! Note: Commenting below counts as a giveaway entry and signs you up to receive updates from Kino MacGregor.